This month I continue with Bonita's case study, the laminitis case from last month's newsletter. Bonita is a wonderful study in hope. She was one of the worst laminitis cases I have ever encountered and yet she is now living a happy life and continues to improve steadily. 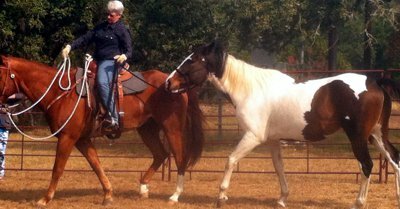 Treating laminitis horses takes perseverance and grit, but I have seen even very severe cases recover with a holistic approach. Bonita is a perfect example. I sent Bonita home on November 8 and her family reports that she has continued to do well. I felt she needed to be home with her family and she has been much happier. I kept her on the Chinese herbs and Pergolide, and Cecilia Adamson has been trimming her feet. We will recheck her ACTH after the seasonal rise effect goes away, probably in January. We will radiograph her at this time as well. I am very pleased with her and believe that with careful dietary management, good hoof care, and the Pergolide to lower her ACTH levels she can have many more good years. I went out to check on Bonita and she is doing great. Cecilia called me today with another good report. Bonita is giving leadline lessons with her kids and loves the attention. We did increase her dosage of Pergolide to 1.5 mg a day, but we have been able to decrease the level of her Chinese herbs and stopped the aloe and slippery elm since her stomach seems to be healthy at this point. I went by last week to check on Bonita and am pleased that she is continuing to improve. Her hoof has almost grown off the resection, which was done last August. She still has a pulse in both hind feet but that does not bother me since she looks so good when she walks. Laminitis in horses is such a challenge because you almost always have multiple systemic problems, which are the underlying cause of the pain in the horse's hooves. In Bonita's case her blood work shows that she still has elevated ACTH levels and now she is showing some insulin-resistance as well. Since we already have her on a very restricted low-carb diet I have to believe the Cushings or PPID is driving the insulin-resistance. To counteract this problem, I have increased her level of Pergolide to 1 mg twice a day. Laminitis in horses can be a real challenge for the farrier as well. In Bonita's case we have Cecilia Adamson working on her, and Cecilia and I have treated so many cases together that we totally agree about what needs to be done to the horses hooves to stimulate growth yet protect the function of the foot. We have not used shoes to treat laminitis in horses in years because returning the horse's hooves to normal function as quickly as possible is what helps so much with the hoof circulation. Bonita's quality of life is excellent right now despite her lab results. She is teaching riding lessons to little kids and living out in the pasture with other horses she likes ( I know the pasture grass may be high in sugar but being out keeps her stress level low). She loves her home and her people. I will continue to monitor her blood work and keep an eye on her hooves, but so far I am pleased with her progress. I got another report from Cecilia yesterday and Bonita is continuing to improve. Cecilia said that for the first time, after trimming one hind foot and putting it down, Bonita did not immediately pick up the other foot to rest it. Bonita's owner reports she is fine for leadline lessons but is not happy about having to wear a bridle. I feel Bonita knows she is not ready for any serious riding and when she starts to accept the bit we can trust she feels well enough to handle more work. The increased Pergolide seems to have made a big difference. She is walking even better and the pulse in her back hooves is completely normal. I am a bit concerned because she is gaining weight back quickly, even on the tight ration. I cut her feed back slightly and suggested she have a bit more work in her lessons with the kids. I did a Bowen session on her to keep her muscles relaxed and she had some nice releases over her shoulders. I am sure she has some lingering muscle spasms from spending so many months with her weight shifted forward off her sore back legs. Overall I'm incredibly pleased with her progress. Bonita is a walking testament to the fact that while laminitis is not a condition that can be cured quickly, dramatic improvement over time is a very real possibility.